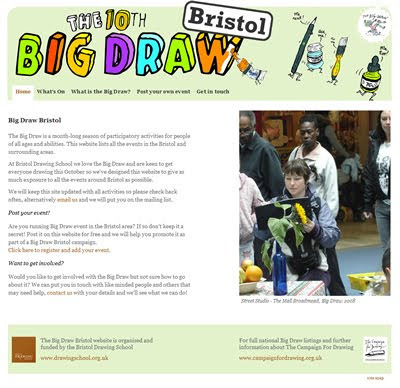 We've created a website to list all the Big Draw events in the Bristol area this coming October. It’s just gone live and we are encouraging people to register and post their own events, we will be expanding it soon with a forum, more info and maps. We enjoy putting on events for the Big Draw here at the Bristol Drawing School, and we thought that last year there was a number of good events in the Bristol area but no real co-ordination between them, so we thought it would be good to have a local resource for people to get know what each other and doing and perhaps swap ideas and experience. Having this resource should also help with local publicity as we can present all the events more as part of a wider festival, city wide as well as national, and hopefully get more people involved and drawing!